After making a custard which entailed using a few egg yolks, I was in fact left with three egg whites. Easiest solution? 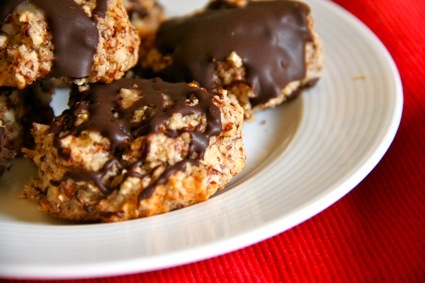 Grind up some almonds and make a light, gluten free treat. Egg whites are great for making gluten free bases for tarts – it’s just a matter of choosing your nut of choice and mixing it to the right consistency. The almond flavor in these cookies is a little heavy, so I lightened it up with a bit of lemon zest a little powdered sugar and lemon icing afterwards. The chocolate was an after thought, but hey, when can you ever go wrong with drizzling chocolate over something? Rarely. In a bowl, beat the egg whites until they form stiff peaks. Fold in sugar, almonds, vanilla, sea salt and lemon. Drop onto a greased baking sheet (or one covered with parchment paper) in spoonfuls, gently press your thumb in the middle to make a slight imprint and bake at 350F for about 10 minutes. To make the icing, combine the powdered sugar and lemon juice and combine until you get a thick consistency. Place a drop of frosting in the middle of each cookie. 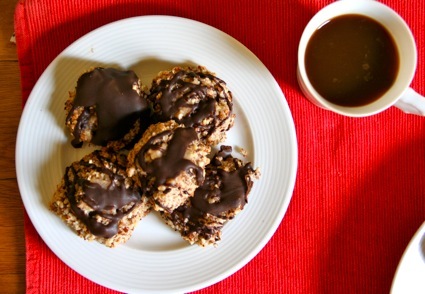 To make the chocolate topping, melt the chocolate and butter in a small saucepan and drizzle over all of the cookies. Wait for chocolate to cool before serving. Or don’t. It’s good either way!